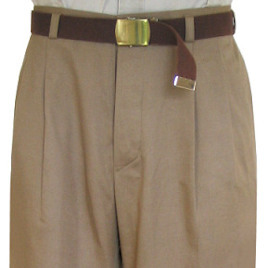 I recently received a pair of Adventure pants in 100%English Wool, color Camel. I'm extremely happy with them, especially the quality of the cut and the drape, (the color and design is vertually identical to the pants worn in 'the third movie'). The fit, as in the prior aquired shirt, is exactly as my measurements requested. in the market place. Not only do you get the necessary accuracy, much sought after, but you get made to measure, bespoke tailoring thrown in. I sincerely hope that Mr Magnoli is a relatively young man, as I intend to make use of his service for a good long time.